Leotards, the skin-tight garments that cover the torso and (sometimes) arms, leaving the legs free are a common sight in everything from little girls’ dance recitals, gymnastics, and figure skating to the Olympics. Favoured by those who participate in active pursuits for the flexibility that they offer, leotards were made popular by Frenchman Jules Leotard. Born in 1842, Leotard is best known for inventing the flying trapeze routine. His father owned a gymnasium and trained Leotard in his early years. As a boy, he became proficient at the parallel bars and eventually thought to suspend a few ropes from a high bar. This was the birth of the trapeze. He first practiced on a trapeze above his father’s swimming pool in Toulouse, making for a splashy landing if he fell. At the time, acts of human skill were experiencing a resurgence of popularity and circus acts were all the rage. Leotard debuted his skills at the Cirque Napoleon where he performed for 12 minutes, somersaulting in the air over guests having their dinner. He then began performing his act with the Cirque Franconi in Paris, becoming their main aerialist. He went on to impress the crowds in London in 1861 at the Alhambra. It was reported that ladies were particularly fond of him because of the garment he wore: a knitted all-in-one suit that stretched taut against his muscles, showing off his physique. The leotard served practical purposes as well, of course. It was easy to move in and aerodynamic, so he didn’t have to worry about bits of cloth flapping around while he leapt from rope to rope. This garment was called a “mailott” initially, which simply means “shirt” in French. 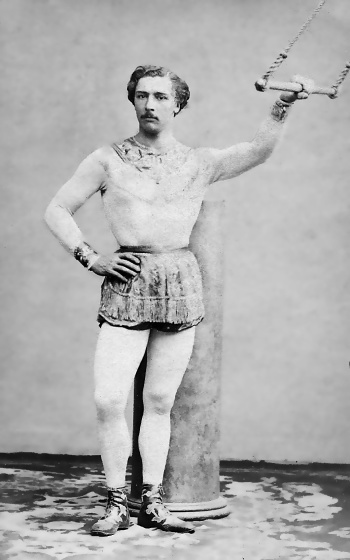 Leotard’s trapeze act became incredibly popular, and he performed again in Britain, appearing at the Ashburnham Hall in Cremorne where he jumped between five trapezes, performing a somersault between each one. He also appeared in London between 1866 and 1868, working in locations like pleasure gardens and music halls. His travels took him to Spain, which is where he met his end. He died there from an infectious disease, likely small pox, when he was just 28 years old in 1870. However, his legacy lives on both in the trapeze act and the leotard. Likely because of the flying trapeze master’s role in popularizing the garment, the leotard slowly became known as such in the 1880s. Even then, the garment was mostly used for circus acts. It wasn’t until the 1920s that it became a popular outfit on Broadway shows and for dancers, and it didn’t quite hit ballet until the 1960s. Leotards later were featured in many exercise videos starting in the 1970s as well. The style of leotards influenced the style of women’s swimwear in the 20s and 30s. Interestingly, the word “maillot” was introduced to the English dictionary in 1928, mostly referring to women’s swimwear. Maillot is now mostly obsolete, with “one-piece swimsuit” replacing it. In France, a swimsuit is known as a maillot de bain. The word “trapeze” comes from the late Latin word “trapezium” which also gives us the word “trapezoid.” It’s likely that this word was chosen due to the shape that was created between the ropes, ceiling, and crossbar. It was first used in English in 1861, the same year as Leotard’s London debut. While he was encouraged by his father to pursue gymnastics at a young age, there was a point in Leotard’s life when he turned away from his training to become a lawyer instead. He actually studied for and passed his law exams. However, he tired of law shortly before joining up with the circus in Paris. A somewhat boastful man, Leotard predicted that anyone who tried his trapeze routine after him would probably fall and break their necks. Obviously, we know that didn’t happen and the flying trapeze is still popular today. Leotard married once, in 1862, to a woman named Domenica Serafina. The relationship wasn’t to last, and by 1864 there were rumours that Domenica was suing Leotard and asking for an annulment. A leotard that also includes shorts or pants is called a unitard.